Accidental learning, the kind of informal learning that takes place in online games, is now the rule. The risks of gameplay are low and the opportunities for collaboration high. 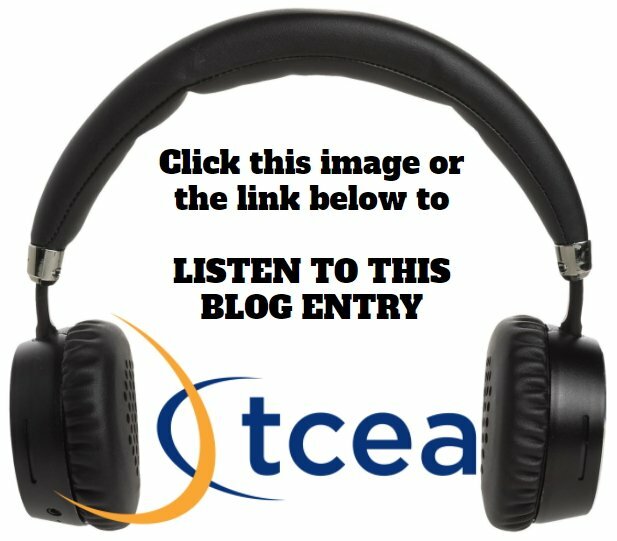 Why not use online games like Fortnite to teach collaboration in schools? Let’s explore a topic that so often results in a battle royale: gaming in schools. The wildly popular game “Fortnite Battle Royale,” an online shooter in which 100 players fight to the death on a cartoonish island arena, is entering the world of higher education. Ohio’s Ashland University announced this week that it’ll be the first college in the U.S. to offer scholarships specifically for the game. Reid challenges us all to ask an important question: “Do we want students learning collaboration as they hunt and kill others?” Dr. Harrison McCoy is in agreement with Reid and expressed dismay about promoting the use of Fortnite in school. Read the twitter conversation. Special Feature: Dr. Harrison McCoy offered more extended reflections. Those will be included as a comment on this blog entry. Thank you, Dr. McCoy! Meanwhile, others suggest there are real benefits to using games for learning. It’s learning to be – a natural byproduct of adjusting to a new culture – as opposed to learning about. Where traditional learning is based on the execution of carefully graded challenges, accidental learning relies on failure. Virtual environments are safe platforms for trial and error. The chance of failure is high, but the cost is low and the lessons learned are immediate. Brown points to the collaboration benefits as well. When role-playing gamers team up to undertake a quest, they often need to attempt particularly difficult challenges repeatedly until they find a blend of skills, talents, and actions that allows them to succeed. This process brings about a profound shift in how they perceive and react to the world around them. They become more flexible in their thinking and more sensitive to social cues. Students are often more engaged in online games than at school. Our collective fixation on high stakes assessments has distracted us from engaging learning. Research suggests we should focus on what works. The research firm Demos discussed this phenomenon in 2007. The report, entitled “Their Space: Education for a Digital Generation,” remains relevant. The authors suggest that moral panic is normal. We experience it when coming in contact with new technology. Instead of hysteria, however, we should encourage learners to reflect on their burgeoning media literacy. That effort could happen at school. The authors also suggest blending collaborative projects into instruction. Researchers have found no evidence to support the theory that video games make players more violent. Science Daily (2015) reported violent video games are not linked to aggression. In 2014, Ohio University found other results. Researchers found gamers, like non-gamers, had the same neural response to provocative images (Source). It is too easy to blame our creations, our tools and instruments, for our own failings. Gun violence has affected more than 187,000 students since Columbine. What steps should we take in schools? Decide first how to best engage your students. Should you rely on gamification of learning? 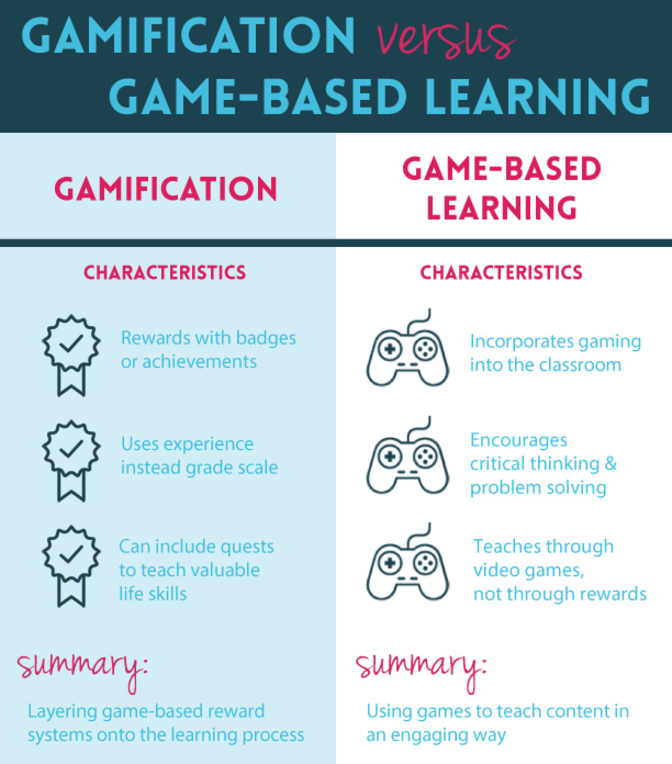 Or game-based learning (GBL)? The former relies on using game design techniques. Gamifying makes the learning process more enjoyable and motivating (e.g. Classcraft). The latter approach (GBL) relies on students playing games. Some examples include Minecraft: Education Edition and Cignition in class. Rather than adding badges and rewards, GBL uses video games to teach a subject or skill itself. Students learn to think in a critical manner, solving authentic problems for themselves. Before jumping to adopt game-based learning based on Fortnite, first inventory your biases. Mine are easy. I’ve been a gamer since age thirteen. My son plays Fortnite, narrowcasting his gameplay via Twitch. I see little evidence of game violence manifesting in our lives. Set boundaries, craft a class contract, and assess participation. Second, ask yourself, “Is the design of a game easy to adapt to learning objectives?” In the case of Fortnite, game design may not be overcome due to the amount of peer slaying that is central to play. Rely on game engines that can be adapted to learning objectives. Third, decide “How have you involved stakeholders (parents, administrators) in the curriculum development process?” Without their involvement and their support, you are setting yourself up for failure. Brave educators have adopted game-based learning before, but society often expresses itself in schools. For some communities, game-based learning has arrived. For others, not so much. Make sure your enthusiasm doesn’t result in a battle royale in your school. I would love to hear other opinions on this issue. Share your professional remarks in the comments or link to your blogged remarks. Hacking your class set of iPads can help students learn. If you are ready to make vocabulary study more interactive, come along! Let’s review the primary cognitive processes involved in active learning. After all, who wants to just use technology to do boring vocabulary drills or study alone? Students selecting relevant material. Can you imagine students deciding which vocabulary words and/or concepts they are unclear about and then working to better understand them? Organizing material in ways that make sense to them. Students can use technology, such as websites or apps, to make sense of unfamiliar words and/or concepts. Blending prior knowledge with new information. Students can create concepts maps that connect their own learning with new information. Six steps from Robert Marzano in this tweeted diagram shared via @ImpactWales highlight what we can do as teachers to assist students. 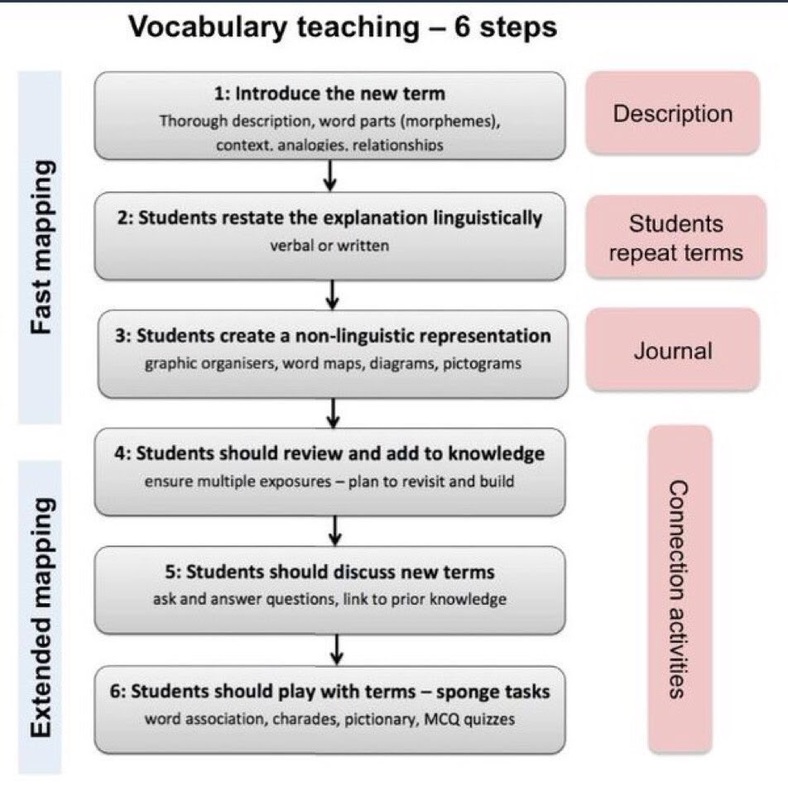 Students should be introduced to new vocabulary via the following six steps. Take a moment to study the diagram, then join me as we explore a variety of iPad apps that can assist students in active learning achievement. Students can put their vocabulary words in the mouths of historical figures or others using the PhotoSpeak app (click to see sample lesson), which makes it easy to take a photo and represent it. Students can audio record themselves and then match it to a photo of a person. Pupils can create a compare and contrast chart, exploring a vocabulary word and its relationships with other words, using Doodle Buddy (click to see more activities). Learners can create a photo collage of pictures/images that represent the vocabulary word using Moldiv. Students can capture or locate a photo that represents their vocabulary word and, using the Perfect Captions app, students can add a caption to the picture. Older students can also create dialogue in the image, if historical or featuring different actors, to explain the meaning of the vocabulary term or use it appropriately. Each of these activities takes advantage of a different app; however, using an app like DoInk’s Green Screen (find out more), you can “app smash” the creations into one video or image. This allows teachers and students to add themselves to the explanation of a compare and contrast diagram created with Doodle Buddy or Perfect Captions. Students may also choose to use iPad whiteboard apps to facilitate explanation of a word. For example, a “Draw the Word” activity can help students using a digital whiteboard app. Those include apps like BaiBoard, Educreations, Quick Sketch, ShowMe, Whiteboard, or Whiteboard for Kids. These digital whiteboards allow students to visually represent their concept of a word’s meaning. In some cases, like Educreations, students can also include audio. To extend student learning about vocabulary, hacking iPads can also involve creating concepts maps using apps like Ideament (iOS, free but $2.99 for full features), iBrainstormer, Total Recall – MindMap, or Penultimate. Students could also interact with each others’ creations, recording their understanding of a diagram or video-recorded explanation. Using a free service such as Seesaw, students may turn in their work and/or link to other students’ vocabulary terms. They can also leave comments and be inspired by each other’s creations. “Beam me up, Scotty,” said Captain Kirk from the surface of the M class planet he stood upon. He fiddled with his communicator. That was strange. No signal. Turning to one of the students, he asked, “Lend me your iPad, will you?” If you’re ready to join Captain Kirk and other Star Fleet officers, come along on this voyage of discovery featuring tablets in the English Language Learners’ (ELL) classroom. In this blog entry, we will explore various approaches to blending technology into the language learning classroom. Our focus is on how to strategically empower language learners to make their thinking visible. Tips on how to save, collect, and share work using key apps will also be discussed in the context of a project-based learning activity. The benefits of creating these types of items in your classroom is that they allow for a combination of audio/video and text in an engaging way. What are some of the ways student-created ebooks are used in your classroom? Ready to flip learning in your classroom? You will want to watch this short video shared by Navasota ISD’s Todd Nesloney. It features an end-of-year interview with fifth graders. Greater than fifty percent of learners are non-linguistic. This involves students generating a representation of new information that does NOT rely on language. Robert Marzano says “the average effect [of using non-linguistic representation] includes a seventeen percentile point gain in student achievement.” Wow. For language learners, consider that “when students make concept maps, idea webs, dramatizations, and other types of nonlinguistic representation, they are actively creating a model of their thinking.” Building virtual worlds in Minecraft: Education Edition can “encourage exploration and experimentation by allowing learners to manipulate their learning experience and visualize results. When students then explain their models, they are putting their thinking into words” (Source). You can make interactive print-outs and pictures using augmented reality (AR). You are able to augment real artifacts and objects that may be around with images, audio, and text. Add QR codes to augment real objects, adding voice or video links. Use Inigma QR Code reader to test the QR Code. Record an audio summary of the information using Vocaroo.com website or VoiceRecordPro (iOS). App-smashing is when you give students a specific assignment that can best be solved using more than one app. The final key area involves relying on tools like NearPod and Seesaw to quickly share lessons and assess students, as well as gather student work on devices. NearPod and Seesaw empower teachers (and students) to create assessments and turn in their work via tablets like the iPad, as well as other devices (e.g. Chromebook, MS Surface Pro). Using Seesaw, students can turn in their work. Teachers review and approve the work for sharing in the class blog (see example). If you are interested in learning more about these tablet trek away missions, fill out a workshop request form to have it facilitated at your school, district, or education service center. You will take on the role of one of Star Trek’s famous captains and explore the various tools and apps embedded in a Star Trek away mission.